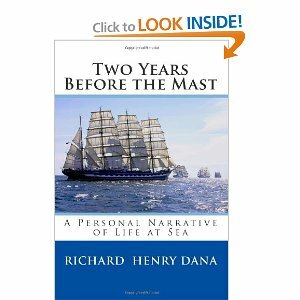 Two Years Before the Mast is Richard Henry Dana's account of collecting cow hides in California between 1834 and 1836. The book is considered a classic. I read it for the first time about a year ago. If you've never read the book or never even heard about it before, you can go on the internet to find out more about it. If you have a Kindle, you can even get a free copy of it. Or you can go to your library. I'm not trying to plug the book, mind you. If you live in California, the book probably holds more interest for you than if you live in say, Iowa. In any case, I live in California now and so the book has more interest to me than the average citizen of Iowa because it talks about places that are more familiar to me than to the citizens of Iowa. A little side note here before I go on with this narrative. Perhaps because Dana's book is out of copyright, publishers can't make much money on it so they don't want to pay extra to get a picture of a boat that actually resembles the one that Dana sailed on. Dana sailed on a brig which is a two masted, square rigged vessel. Good luck finding one of those on the cover of his book. Things were different in the California of 1834 than they are in the California of today. The gold rush had not started yet. San Francisco was not a city yet. Nothing was the same as it is now except for the weather. Dana writes about the winter storms, south-easters. They brought rain and high winds. They still do. We just had one of these storms. Dana tells us that when his ship saw a south easter coming on, the captain would take her out to sea. The coast was not safe. California has few natural harbors. Far off the coast was the safest place to be in a storm that was blowing landward. It still might be. When I got to the shop today, one of the guys told me that Eric, a guy who lives on a sailboat had been looking for me. His boat had just sunk. I don't know why Eric was looking for me. The guys in the shop hadn't taken good notes. So when I was done doing what I had to do at the shop, I drove down to where Eric's boat had been anchored. Sure enough, Eric's boat was up on the rocks and had a big hole in it. Eric wasn't around but some other people were working on his boat, pumping water out of it. A bunch of his gear was piled up on shore, including the rowing scull he used as a tender. And then I was wondering, what kind of sailor was Eric? Didn't he know about the dangers of a lee shore, hadn't he read Two Years Before the Mast? Maybe he thought he was in a safe anchorage. But he wasn't. And last year another boat was anchored in the same place as Eric and about the same time of year, a winter storm came in and blew his boat into the rocks and sank it. When I first moved to the Bay area, I was surprised that people called rainy weather a rain storm. It never really rains all that hard but I guess it blows hard enough to drive boats up on the rocks just like 200 years ago. Maybe I'll give the next guy that anchors off that rock wall in the winter a copy of Two Years Before the Mast.